One of the pitfalls of being an extremely successful writer with a blockbuster comic called 'Saga' is you can't just be good anymore. Good just isn't good enough. Everything you ever write will be judged against something as perfect as 'Saga.' 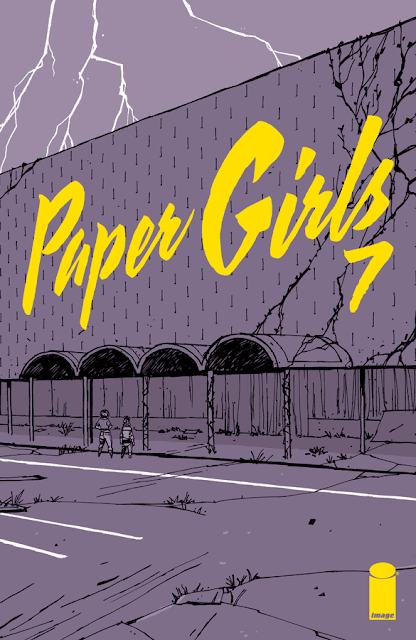 so when 'Paper Girls' with the always amazing Cliff Chiang debuted a lot was expected. A great sci-fi fantasy with a plucky group of girls set in the 80's but the story seemed to meander a bit leading to frustration from fans. With 'issue #7 we're finally getting some character development that was missing and meeting those unfair expectations thrust upon it. Brian K. Vaughan features the relationship of Erin and her future adult self and it opens up a lot of questions that hit home. How happy would you be with your future self? Would you be disappointed? Ashamed with how little you've accomplished? Could you look yourself in the face and be proud? There are loaded moments like that that give this science fiction fantasy a depth and complexity that had been missing. It's an emotional ride that convenes nicely. Vaughan found the heart of 'Paper Girls' and it benefits enormously from it. Meanwhile, there's plenty of turmoil elsewhere, even a giant bloody brawl between humongous tardigrades. That's right, water bears going at it to the death! Chiang continues to do stellar work in not just layouts and backgrounds but conveying the heartfelt expressions on the characters. It's the element that sells this issue and packs the most punch. The pain and anxiety expressed in Erin's face is palpable. The pacing near the end is masterful. Matt Wilson's limited color palette continues to give the series a distinct otherworldly appearance. 'Paper Girls' seems to have turned a corner making its purpose clearer while providing more emotional character development. Vaughan is giving us more from his leading ladies, asking deeper existential questions while in this bizarre future world that happens to be our present day. It's getting better and beginning to meet our unfairly imposed expectations.